Today we won't be focusing on a particular aspect of custom wallpaper. Instead, we want to discuss the unique and creative essence of our company, Great Wall Custom Coverings. Founded nearly five years ago (we celebrate our 5 year anniversary at the end of the month), we sought to create wall murals and custom wallpaper that weren't available to the masses, to create one-of-a-kind installations that our clients would enjoy for years. We didn't realize the special position we'd create for ourselves, not only providing print services but creative consultation, project management, and in general highly innovative problem solving. Along the way we've amassed a body of print work, based on our designs as well as our clients: designers, artists, photographers, architects, and event planners. We've shared photographs of some of these installations to show the breadth of our capabilities, as well as to inspire people in the process of undertaking a custom wallpaper project. The image above is a collage of our installation photos. However, this image was being used on a competitor's website. Fortunately, they were very prompt in removing the image form their site once we contacted them, but the situation illustrates the unique position our company inhabits. Though we are artists by nature, we use commercial printing methods, inks and materials to create custom wallpaper. But as true creative professionals, this synthesis comes naturally; we don't need to fake it. Consider a hand painted mural: you can put a paintbrush in anyone's hand, but that doesn't guarantee a professional, aesthetically pleasing result. Most any printer could take a stab at printing custom wallpaper, but these printers typically specialize in temporary banners; throw away products, and are not comfortable in the realm of interior design or fine art, where we truly excel. Take a company like the one that hijacked our photos above: they think that they can make a few extra dollars by adding custom wallpaper to their product line. With little expertise in the decorating industry, they look to creative company's like us to help create their own creative identity. But no matter how many images of ours they steal, they will never have our vast knowledge and enhanced comfort level when it comes to having a discerning artistic eye. 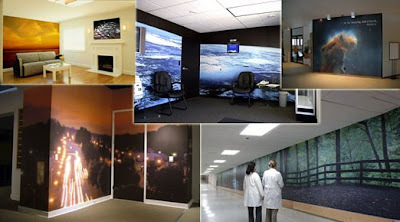 In short, you need to trust your custom wallpaper producer as you would an architect, contractor, or interior designer. If one of these professionals couldn't represent their own work and substituted another's project as their own, would you use them? We sell originality, creativity and integrity, not other people's work. We invite you to check out our installation gallery to see how we've assisted our clients, and to show you how a real creative company can bridge the gap between the disparate worlds of artistic vision and professional commercial reproduction. nice blog for interior decorators..